For all the experts out there. I have a TA crank circa 1982. I would like to use it with a Campy 10 speed group. Am I going to run into problems with the front derailleur? It seems like they like derailleurs with a flat cage. Vintage cranks like TA and Stronglights have very low Q-factor (total width at the pedals) because the crank arms are straight and very close to the big chainring. That's why these cranks like front derailleurs with flat outer plates; a scuplted outer plate will hit the crank arm. I put a lovely Stronglight model 93 on my Rivendell, set up as a triple. I could shift it ok with a an old Suntour double FD with a flat outer plate when I used a friction bar-end shifter. I had no luck with a 9 speed Campagnolo FD; when the shifter was moved far enough outboard to move the chain to the big ring, the outer plate hit the crank arm. I had poor performance with the flat plate Suntour double FD and Campagnolo Ergopower shifters (Athena 8-speed). I bet that you could get 10 speed Campy to work with an old flat plate FD and the TA crank if it's a double -- they're not as picky as triple cranks. That said, I bet you'd have much better shifting performance with a 10 speed Campy crank. The current 10 speed Veloce, 10 speed CX, and 11 speed Athena cranks are still available in silver, and they're pretty handsome. Another consideration -- your knees may prefer a low Q-factor. I have a nice Comp Triple crank. But at 57 the 53T big ring is useless. Plus the TA crank does look cool. I really don't want to spring for a VO copy when I have the real thing. The VO crank would let let me use a standard front though. You could swap the rings on your Campy Comp Triple to ones that work better for you. Ribble.uk has modern Stonglight rings in the Campy 135 bcd, in all sizes (~$20 for 5083 alloy, and ~$30 for 7075 alloy). You could even replace the big ring with a bash guard and replace the middle ring with a 46, and just run it as a 46/30 double. The Comp Triple front derailleur works great and is very versatile with a wide range of ring sizes. It's a real gem. The IRD Alpina-D bears a close resemblance and is still in production. I set my Comp Triple crank up with matched 52/42/30 rings, but my knees are 20 years younger than yours. I'm not familiar with how the rings are mounted on your TA crank, but I know that they're versatile enough to be used as triples (with a longer spindle BB). If you could set the TA up with a bashguard/46/30, that would give it enough clearance to use a modern FD with a sculpted outer plate. The VO rings are ramped and pinned so you can easily run 10s. May need different spacers (narrower) to the inner ring, maybe not. I run 10s on a nervar crankset and it works very well. 10sp on a vintage Nervar crank? 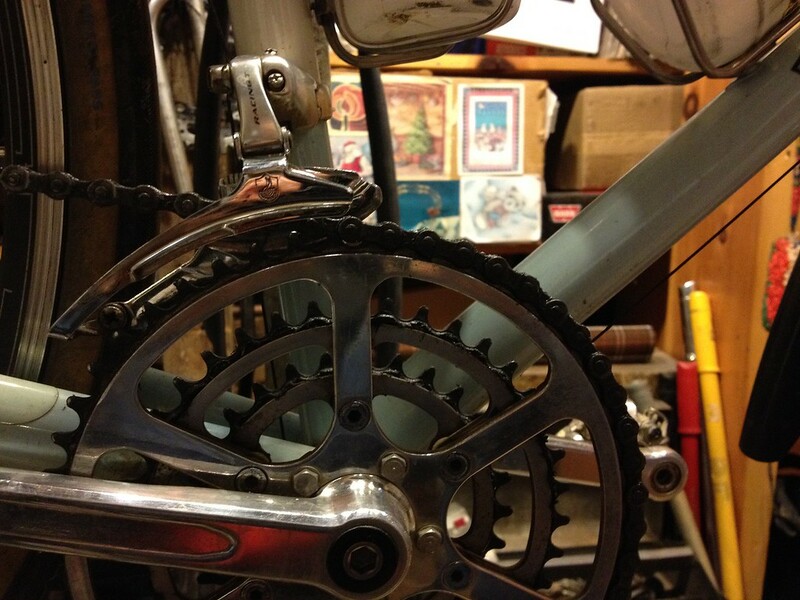 Dang, I've got a vintage bike with Nervar crank and some spare Campy 9 speed derailleurs. Learn something new every day. And I love a narrow Q. The tolerances are close but it works great. The problem I've run into using TA cranks is that the arm sits very close to the chainring, and post-CSPC front derailleurs with the safety "lip" sometimes can't be adjusted to use the large chainring and small cogs without scraping. Using a lipless pre-CSPC front derailleur solves this problem.